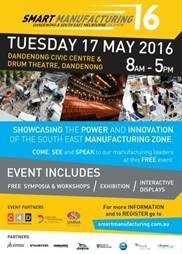 Invenio is proud to support Smart Manufacturing 16, a showcase put together by 7 councils, Committee for Dandenong and SEMMA to promote Dandenong and South East Melbourne as the largest innovative Manufacturing Zone in Australia to prioritise areas for investment, jobs and growth. A Symposia featuring leaders from Bombardier, Jayco, Hilton Manufacturing, Yarra Valley Gourmet Foods, Thales, Northrop Grumman and BAE Systems on topics designed to explore innovation, advanced manufacturing, R&D, commercialisation solutions for local businesses. Seats are limited, please register interest with invenio. Email info@invenio.com.au with the interested session (in program below), with names of attendees, phone numbers and emails for registration. This all-day free event aims to provide insight and practical solutions for local manufacturers and businesses. In partnership with Dassault Systemes, Invenio will be showcasing the Z Space, an interactive representation of virtual reality in real world applications. Come meet the invenio team! See you there!